Best grown in moist, organically rich, well-drained loams in full sun. Best performance usually occurs in climates with cool summer temperatures. Avoid hot and dry conditions. 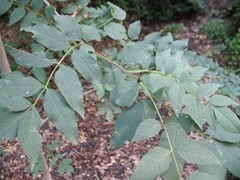 Fraxinus excelsior, commonly called European ash or common ash, is native to Europe and western Asia. It is a large, rounded, deciduous tree that grows to 70-80’ (less frequently to 140’) tall. It is a popular landscape tree in Europe, but has not been very popular in the U.S., in part because of its susceptibility to borers. Specific epithet comes from the Latin word excelsus meaning lofty or high. Emerald ash borer is native to Asia. It was first discovered in the U. S. (southeastern Michigan) in 2002. It has now spread to a number of additional states in the northeast and upper Midwest, and is expected to continue spreading. Emerald ash borer will typically kill an ash tree within 3-5 years after infestation. Once infestation occurs, it is very difficult to eradicate this pest which feeds under the bark and bores into wood. This borer now constitutes a serious threat to all species of ash in North America. European ash trees are generally susceptible to a number of additional insect problems including ash borer, lilac borer, carpenter worm, oyster shell scale, leaf miners, fall webworms, ash sawflies and ash leaf curl aphid. Potential disease problems include fungal leaf spots, powdery mildew, rust, anthracnose, cankers and ash yellows. General ash decline is also a concern. Brittle branches are susceptible to damage from high winds and snow/ice. Planting new European ash trees is no longer recommended given the susceptibility of this tree to the emerald ash borer. Ash trees have typically been used over time in a variety of applications including shade tree, street tree or lawn tree.